This article was written By Rex Baylon on 03 Mar 2011, and is filed under Reviews. Kihachi Okamoto (1924-2005) was a Japanese filmmaker who spent an entire career demolishing the widely accepted viewpoint that there was any honor in violence. Although recognized as a preeminent director of action films for Toho studios his work was constantly being eclipsed by more critically acclaimed directors like Masaki Kobayashi and Akira Kurosawa. Yet, what makes Okamoto’s films prescient is how the theme of history being an invention by those in power runs throughout his oeuvre. The typical Okamoto protagonist is an outcast and victim of the times that they live in, but within this hopelessness came a freedom, be it through death or a rejection of established social codes. So please come join me as we explore the inelegant, the sardonic, the brutal, and the comic films of Kihachi Okamoto. I really wanted to like Ankokugai no Kaoyaku (Tales of the Underworld: The Big Boss, 1959). It has all the ingredients that I enjoy in a film: a yakuza actioner directed by a genre maverick and starring some of Toho studios biggest stars and character actors. Yet the end result was just a derivative mess. The plot could have been lifted from any 40’s noir being produced at Warner Bros. or MGM and although I usually love this type of pedigree everybody involved in this picture seemed to be on autopilot and I struggled to keep awake during the film’s 101-minute runtime. The story, a contemporary retelling of Cain and Abel, has Koji Tsuruta and Akira Takarada playing gangster brothers who are pitted against one another when younger brother Mineo Komatsu (Akira Takarada) decides to leave the yakuza lifestyle and pursue his dream of singing. The film was an unabashed ploy by Toho management to capitalize on the burgeoning popularity of Elvis Presley and rockabilly, especially with homegrown musicians like Kosaka Kazuya and Kyu Sakamoto becoming breakout stars after releasing several Elvis inspired songs in the late 1950’s. Yet the problem with Okamoto’s picture is that Akira Takarada is no Elvis Presley. He may have the looks, Takarada’s nickname at Toho studios was Mr. Handsome, and he does have a pleasant enough voice but honestly he is just too clean cut to ever be a believable gangster or rockabilly singer. And not only that, but veteran actors Koji Tsuruta and Toshiro Mifune are also underserved by poorly written parts. Although by the late 1950’s the elements of the ninkyo-eiga were already set in stone with very little in the way of variation from the formula, even low budget genre affairs offered some unique take on the conflict between giri and ninjo or at the very least had some really exciting action setpieces. Tales of the Underworld: The Big Boss introduces several story elements at the start of the picture but their resolution seems so perfunctory. Older brother Ryuta Komatsu (Koji Tsuruta) has a sick child to take care of and although Ryuta having a young son is supposed to give Tsuruta’s character depth and get us to feel for his plight any momentum in the story was knocked out whenever his son appeared on screen. Ryuta’s son may represent the innocence and goodness that both brothers aspire to but giving the boy a limp and degenerative disease was, to say the least, heavy-handed and the final goodbye between father and son was equally manipulative. Although Tsuruta does turn in a serviceable performance, it’s perhaps no surprise that the actor would soon jump ship and sign with rival studio Toei. 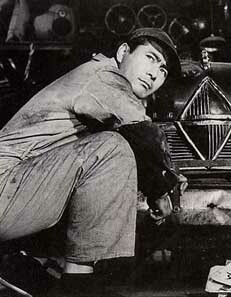 As for Mifune’s role as the mechanic Kashimura, so much dramatic potential was present that it really irks me to have to watch an actor who had won the Best Actor award at the Mainichi Film Concours the previous year for his work in two seminal Kurosawa films, Donzoko (The Lower Depths, 1957) and Kumonosu-jo (Throne of Blood, 1957) wasted on such a cookie cutter role. Though there were times as I watched Tales of the Underworld: The Big Boss that I wished Okamoto would scrap the Komatsu brothers’ storyline and wholly focus on Kashimura. In debt to the mob, Kashimura is forced to lend his auto shop to be used as a place to hold clandestine meetings, destroy evidence, and kill people; and within this context the character of Kashimura could have been an online casino interesting study in guilt and moral relativism, but the way Motosada Nishiki and Shinichi Sekizawa have written the script, Kashimura is nothing more than a contrived and quite melodramatic caricature. Yet, the generic story and bland acting could have been rescued if Kihachi Okamoto was allowed to do his job. Possibly because Tales of the Underworld: The Big Boss was only his third time on the director’s chair, Toho may have been apprehensive about turning a film completely over to a neophyte director and so we only see very faint traces of Okamoto’s future genius but those brief flashes do enliven the film at least for a few minutes. The most obvious evidence cinephiles will have that the movie is an Okamoto production is the impressionistic editing. When not encumbered by having to placate his bosses, Okamoto injects the dull story with some real energy when allowed to freely move the camera and cut scenes based on action and not just making the actors look good for the camera. 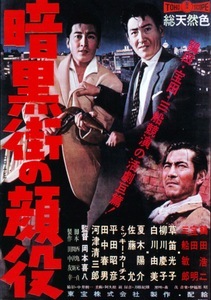 Be it the exterior tracking shot during the opening credit sequence, the use of repetition during the opening murder and later death of a unlucky witness, and Okamoto’s signature brand of humor, like the way he introduces many of the characters in the film by a shot of their feet followed by a pan up to their faces or the brawls that Ryuta gets into which seem more like slapstick comedy than violent yakuza outbursts. Yet what connects Tales of the Underworld: The Big Boss to later Okamoto films is a tangential secondary character that appears much later in the film. Goro (Makoto Sato), an assassin dressed all in black, would be an Okamoto staple which would find its apotheosis in his 1966 chambara classic Dai-bosatsu Toge (The Sword of Doom, 1966) with Tatsuya Nakadai’s Ryunosuke Tsukue character being the epitome of the honorable killer found in so many of Okamoto’s later films. A drifter with no home and with no real bonds or close ties to anyone, Goro is much like the character of Ryunosuke Toge, a grim spectre of death seemingly used by various groups, specifically the yakuza, and appearing only when someone is to be killed. Although an unabashed psychopath these killers do live by a code unlike the men in authority who hire them and, as such, usually end up as victims of their own violent tendencies. Kihachi Okamoto would try his hand at the Tales of the Underworld series again a year later with Ankokugai no Taiketsu (Tales of the Underworld: The Last Gunfight, 1960), his second attempt being a much more satisfying entry into the ninkyo-eiga genre. Yet for all its flaws and although hampered by a studio that didn’t completely have faith in him Tales of the Underworld: The Big Boss does retain certain visual and thematic motifs that would later be explored much more assuredly in the director’s oeuvre, proving that Kihachi Okamoto was and is, even at such an early date, a true auteur of the cinema.